Even though nowadays there are countless of welding processes, only a few of them stick out. Namely, TIG, MIG, and stick/arc welding are the most commonly used ones. However, the two most prominent methods used in construction for heavy-duty welding are the stick and arc welding processes. Let’s focus on these two and see what they involve. This type of welding is one of the oldest welding processes. The main benefits of stick welding are its simplicity and the fact that it produces incredibly strong welds, even when welding two very thick metals. The process involves a single electrode, which provides most of the welding material. When the electrode heats up, it melts, resulting in the workpiece to melt as well, thus joining the two parts together. The rod used in stick welding is coated in flux and it creates a shield around the welding point, protecting it from contaminants. The rods used in stick welding are consumable and they need to be changed frequently. Changing them, however, should not be a problem at all as you can find them in all stores that sell tools and equipment for welding. As briefly aforementioned, this process produces incredibly strong welds, which makes it ideal for welding thick materials, including cast iron. Stick welding is frequently used for heavy repairs, pipes, and heavy steel constructions. All of the tools and equipment for welding involved in this process are affordable compared to the more sophisticated TIG and MIG welding equipment and tools. Lastly, stick welding can be performed even in harsh, windy conditions. Arc welding uses a consumable wire that’s continuously fed to the weld. The wire used in arc welding instantly generates a gas shield around the welding point. 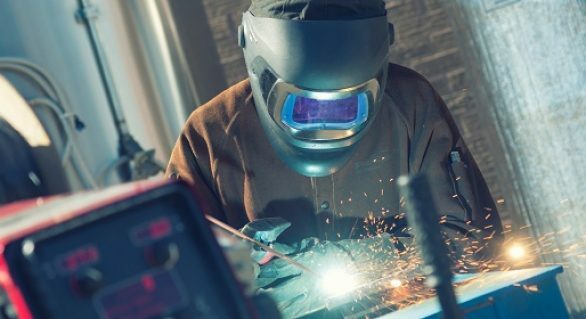 Moreover, there’s also a process known as dual-shielded welding which utilizes another external gas supply to create a second shield to ensure a more secure weld. Of course, you’ll need to replace the consumable accessories that get spent in the process. Similarly to stick welding, arc welding is ideal for thicker and heavier materials. However, this process creates a lot of heat so you need to make sure the metals you join together can withstand it. Arc welding is mainly used for heavy steel erection and construction, heavy repairs on machinery and other equipment. This method is very efficient, produces little waste and contains a shield and welding material 2 in 1. That being said, there’s little to no cleaning required because of the small waste production, as well due to the fact that the consumables used during the process are utilized very efficiently.